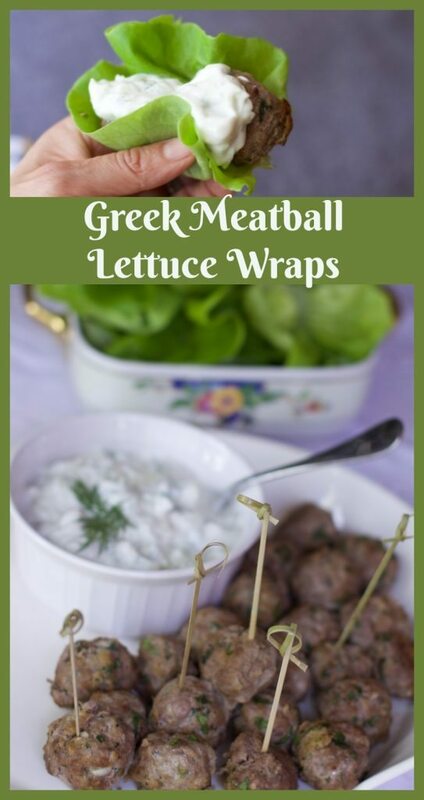 Thank you ALDI for sponsoring this post and giveaway about Greek Meatball Lettuce Wraps with Homemade Tzatziki. All opinions are 100% my own. Be sure to find all of these ingredients and others at your local ALDI Store. This is the second post from my Greek Inspired Taste of ALDI Party where I hosted nine friends to educate them on all the new products at ALDI. In addition to the Quinoa Tabbouleh I served, I made Greek Meatball Lettuce Wraps with Homemade Tzatziki using the SimplyNature Organic Grass-Fed Ground Beef from ALDI. With more people reducing carbs in their diet, Lettuce Wraps are a great alternative to pita sandwiches. 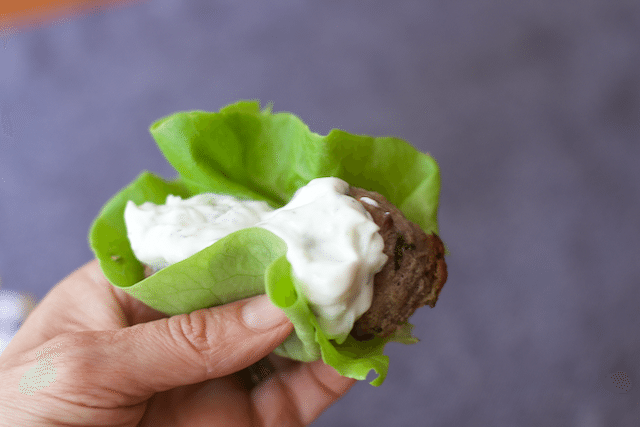 These Greek Meatball Lettuce Wraps are full of flavor and are topped with Homemade Tzatziki Sauce that can be made a day ahead of time. Make these for a crowd or for your family, either way you are sure to get compliments to the chef. Be sure read the entire post to enter the Giveaway. 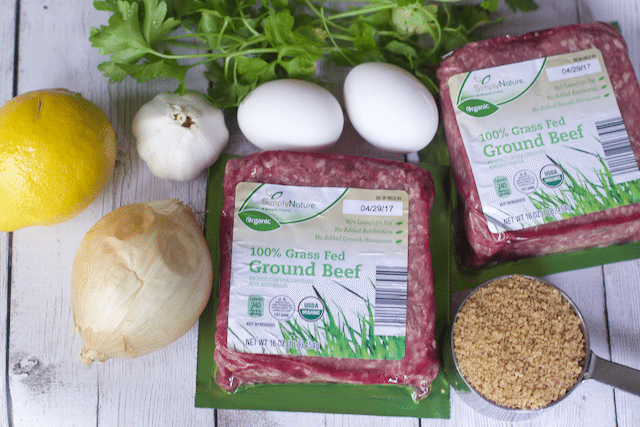 The meatballs started with a few fresh ingredients but most importantly the SimplyNature Organic Grass-Fed Ground Beef from ALDI. At $5.99 a pound I was impressed. I am doubling this recipe so I can serve half of the meatballs for my lunch and the other half for my family’s dinner. With the great pricing at ALDI, doubling the ingredients does not hurt the pocketbook. Besides that, I could eat Greek food all day, every day! You might get your hands dirty on this recipe. The key to meatballs is not over mixing as it can cause the meatballs to be tough and no one likes tough meatballs. To make uniform meatballs that were also small enough to fit in a lettuce wrap, I used a small ice cream scoop. 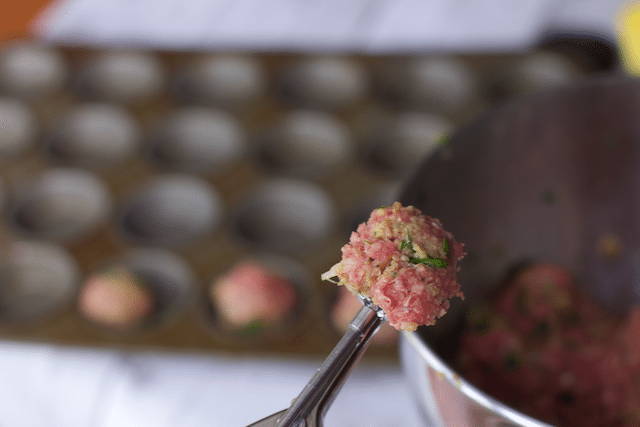 After seeing this on Pinterest, I baked the meatballs in a small muffin pan so they would not roll around and off a baking dish (you can make them to this point, cover and refrigerate until you are ready to bake for your meal). The only challenge with this baking method is cleaning each individual muffin compartment. 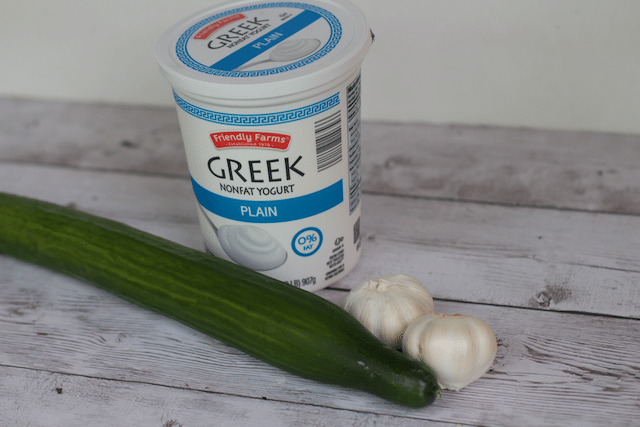 Meanwhile, make your Homemade Tzatziki Sauce using Friendly Farms Plain Greek Nonfat Yogurt and cucumbers. This is an important step in making Homemade Tzatziki, be sure to ring out most of the water from your shredded cucumber. 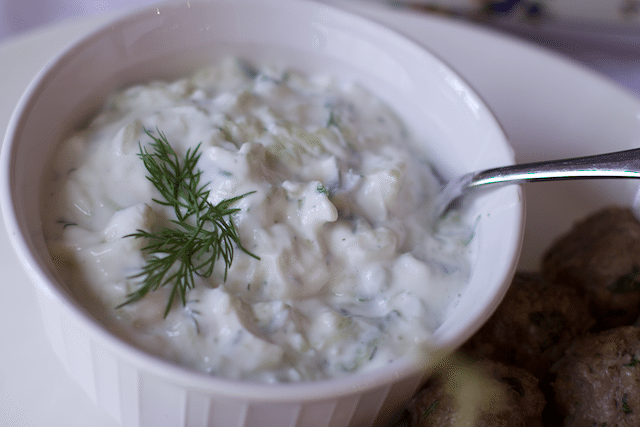 Homemade Tzatziki is such a great complement to so many Greek dishes. 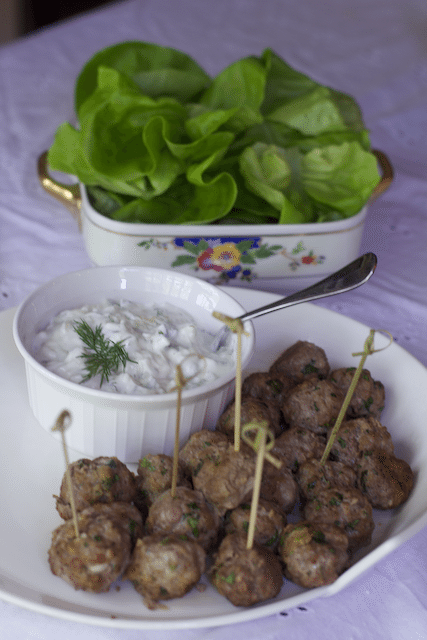 For serving, simply put out your Greek Meatball Lettuce Wraps with Homemade Tzatziki on a platter. 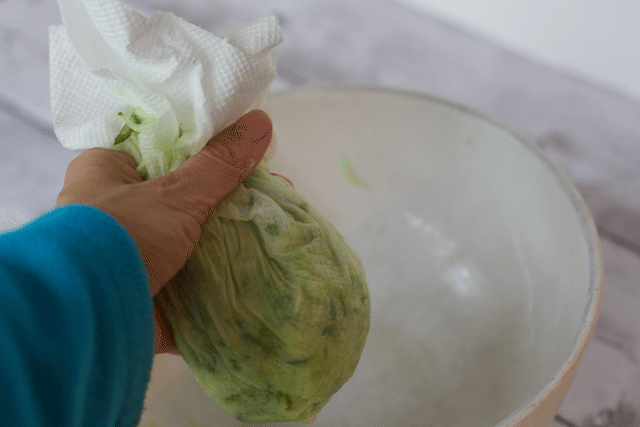 Have a side of Bibb or Iceberg leaves so guests can make their own lettuce wraps. Just pick up and eat like you would any sandwich. Such a yummy combo in my opinion. Thanks to the folks at ALDI we had a wonderful Greek Inspired Lunch with quality ingredients you would find anywhere else. Place the yogurt in a medium bowl. Grate the cucumber on a box grater on the largest grating side and squeeze it with your hands to remove most, but not all of the liquid. Add the grated cucumber to the yogurt. Add the sour cream, lemon juice, vinegar, dill, garlic, 2 teaspoons salt, and 1/2 teaspoon pepper and combine. Taste for seasonings. Line a baking sheet with foil and spray it with cooking spray or spray the inside of a mini muffin pan. 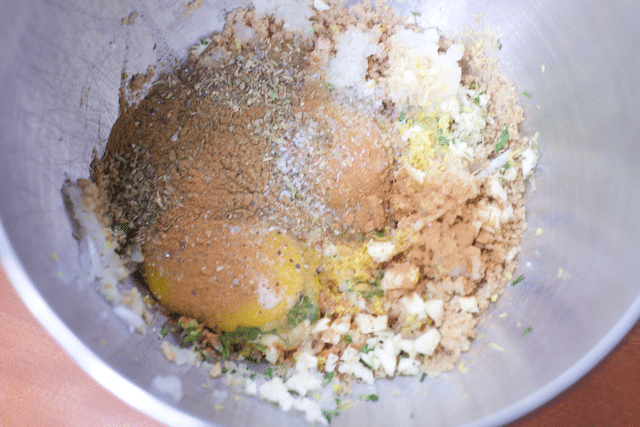 In a large bowl whisk together the panko, parsley, grated onion, garlic, lemon zest and juice, egg, spices, salt and pepper. Add the ground beef to the mixture and combine with your hands being careful not to overwork the meat mixture. Form approximately 1 tablespoon sized meatballs using a small ice cream scoop. 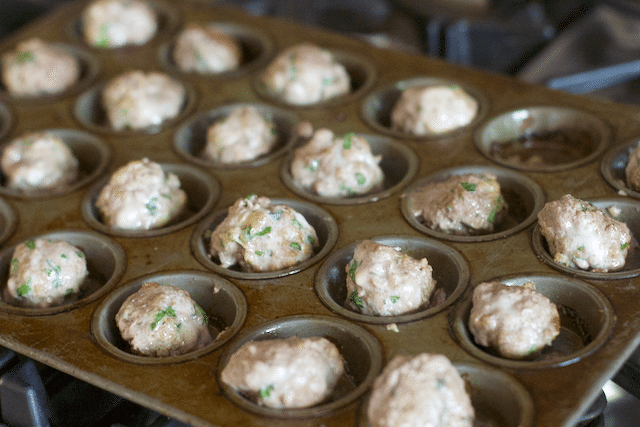 Place the meatballs on the prepared baking sheet or muffin tin, spray the tops with cooking spray, then place the baking sheet on the center rack of the oven and bake for approximately 12-15 minutes or until golden brown. 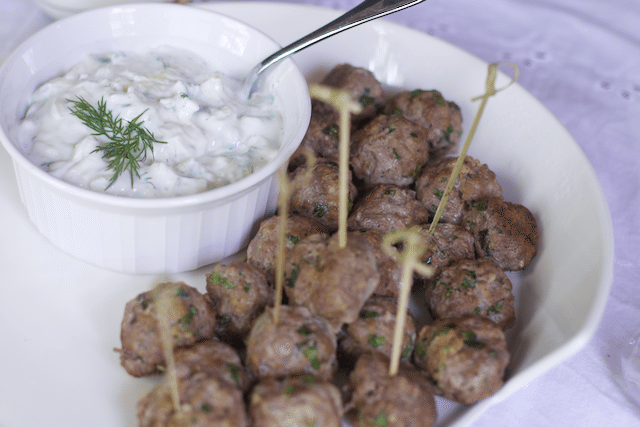 Make the tzatziki sauce while the meatballs are baking. 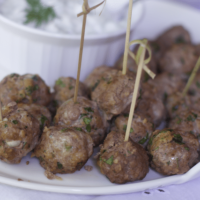 Remove the meatballs from the oven and serve with the tzatziki sauce and lettuce leaves. One lucky reader will win a $250 ALDI Gift Card to buy all the wonderful products we discussed and more! Enter the Rafflecopter below. Be sure to enter this $50 Fathers day gift card Giveaway too. We have an Aldi right down the street from us. We get all our produce from there. I love how they have special items for sale a lot like pots and pans, etc. They also sell great cookies ? I love Aldi. The have a nice selection of products and they have good customer service. Although the meat section is small when compared to traditional grocery stores, the quality and prices are great. I’ve always liked Aldi’s prices and their store layouts. We love shopping at Aldi because the prices are always reasonable and low. Produce is fresh and we can always find what we need. These wraps look so delicious! I love Aldi! Their prices are so good! Their chocolate is really tasty too. I’ve never shopped at Aldi, but we do have one near us and I’d love to try them out, especially since they have grass-fed beef. I think my boys would love the meatballs! I love that Aldi has the best prices and you don’t have to sacrifice flavor! Win, win! Thanks for the chance at the $250! We’d certainly put it to good use. enter the giveaway and you have $250 more to buy the meat!! Yeah I think next time Ill do it on a piece of foil on a cookie sheet! These meatball wraps look delicious. The bibb lettuce is perfect for catching all the lovely sauce. I’m sure the flavor is totally worth the muffin tin cleaning! I didn’t realize Aldi sells grass-fed beef! I need to head over there. 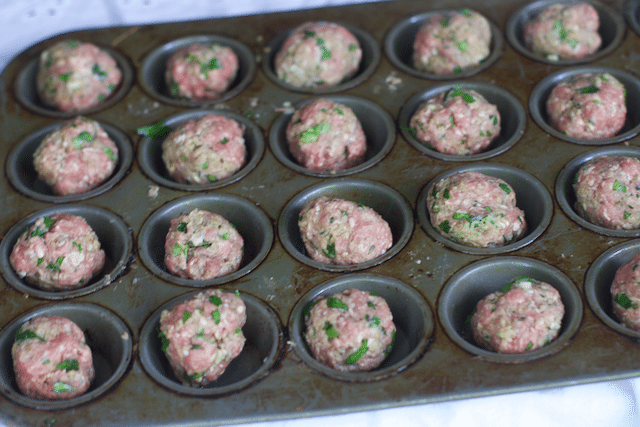 And, I love the idea to bake the meatballs in the muffin pan. Nice recipe! Aldi is super budget friendly. I save lots by buying my canned goods and dairy items there. Your meatballs are a must-try! I am totally craving this now! Looks amazing! 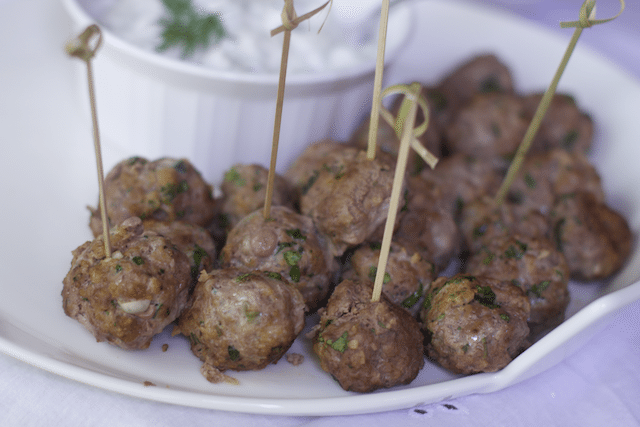 I love Greek style meatballs and love how you served these up. They look delicious!